Important Note: Because Catalonia's government encouraged voters to evade police disruptions by voting outside of their home municipalities if necessary, many smaller towns registered more votes than their total number of residents. That also means these maps should be seen more as a picture of people who voted in each municipality than of people who live in that municipality. Municipalities are grouped by the thicker lines into county-like comarques. You can find the names of the comarques on this reference map. Which parts of Catalonia supported independence the most, and least? The above map shows how pro-independence voting varied between Catalonia's 948 municipalities. Though Spanish police or other opponents managed to shut down some polling stations (shown in gray), most municipalities registered large proportions of ballots answering YES to the question, "Do you want Catalonia to become an independent state in the form of a republic?" In fact, no municipality's votes came in with less than 64% in favor of independence. 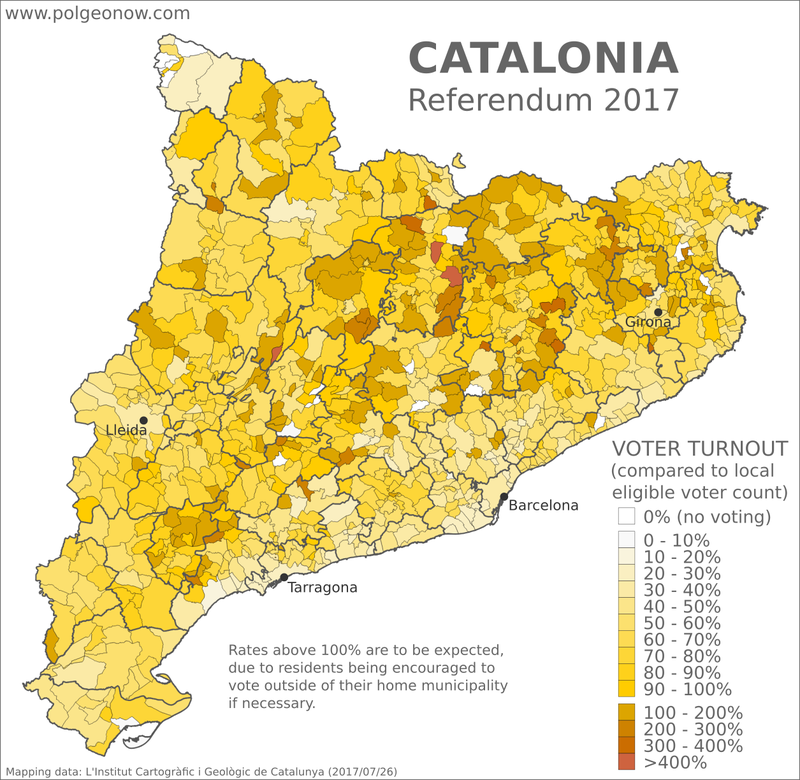 Rural areas tended to register higher proportions of YES votes than urban areas, with concentrations of NO votes clustered in two key areas: (1) the suburbs of Barcelona, Catalonia's largest city and most diverse area, and (2) the Aran Valley at Catalonia's northwestern tip, an isolated area separated from the rest of Catalonia by the Pyrenees Mountains, where people traditionally speak a language called Aranese instead of Catalan. These larger patterns support the common wisdom that support for Catalan independence comes mainly from people who speak the Catalan language. Where in Catalonia was voter turnout highest, and lowest? As seen in the yellow-shaded map above, voter turnout varied across Catalonia's municipalities, ranging from zero turnout where polling stations were shut down, all the way up to...well, over 700%. Though some opponents of the referendum have jumped on these figures as evidence of election fraud, turnout of over 100% was actually expected in many municipalities because of the unusual structure of the referendum. Anticipating police interference, Catalonia's government allowed people to vote at any polling station where they were able to, even outside their home municipality. As such, voter turnouts over 100% neither prove nor disprove accusations of vote rigging or multiple voting by pro-independence activists. There were 13 municipalities where voting never occurred at all, shown in pure white on the above map. According to the Catalan government, these are municipalities where "voting was not possible because of police action," though it's not clear how much effort was really made to hold the vote in the Aran Valley at Catalonia's northern tip, where support for independence is reportedly very low. How many voters live in Catalonia's municipalities? Voter turnout is calculated by dividing the total number of ballots cast by the number of eligible voters who live in an area. 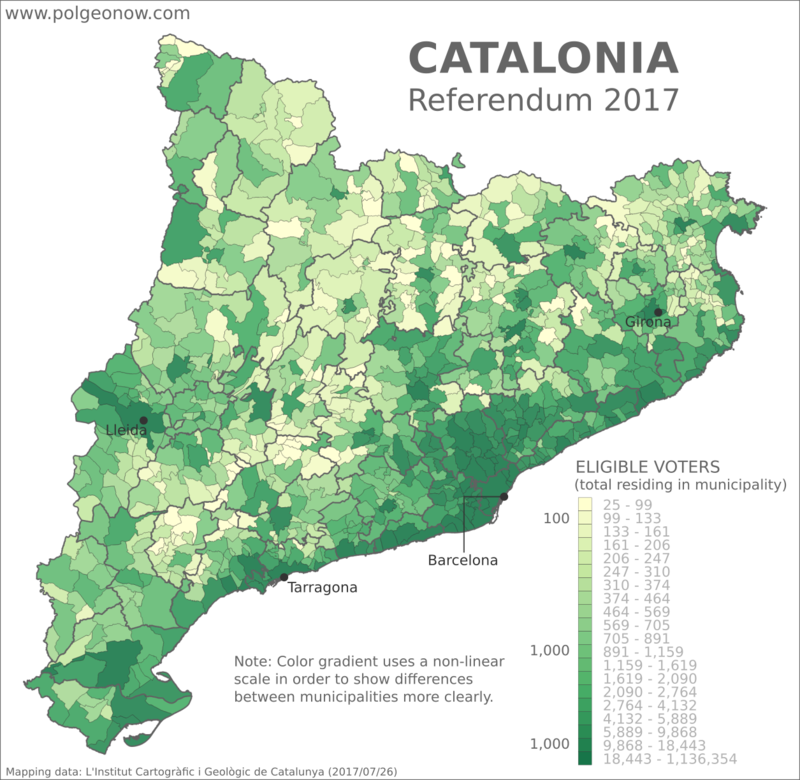 And as seen in this map, the reported eligible voting population of Catalonia's municipalities varies immensely, from as few as 25 people in tiny Sant Jaume de Frontanyà to as many as 1.14 million in Barcelona proper. Comparing with the previous maps, we can see that both low voter turnout and low proportions of votes for independence generally correlate to highly populated areas, while high turnout and high rates of YES votes correlate with less-populated areas (the city of Girona is a notable exception, with a high population and relatively low voter turnout, but a very high proportion of support for independence). It's also clear that municipalities reporting voter turnout over 100% are mostly low-population areas. In fact, nearly all of them reported eligible voter populations of under 500 people. Notable exceptions - and the only ones with voter populations over 1,000 - are Polinyà (5,910 people / 173% turnout), Palau-solità i Plegamans (10,891 people / 142% turnout), and Sant Quirze del Vallès (14,531 people / 109% turnout). These three municipalities are visible in the yellow voter turnout map as the three over-100% turnout areas closest to Barcelona, all located near each other on the edges of the highly-populated metropolitan area. This is consistent with the hypothesis that turnout over 100% was due mainly to voters flooding out of high-population areas and into low-population areas to cast their ballots. And in fact, a close examination of the maps shows that nearly all of the over-100% turnout municipalities directly border other municipalities with lower turnout (or no voting at all) and significantly higher populations. Of course, low turnout across Catalonia as a whole begs the question, if we include people who didn't leave home, what proportion of Catalans actually cast ballots for independence? How many of each municipality's people actually voted for independence? This map, a kind of special hybrid between the YES/NO map and the voter turnout map, shows YES votes as a proportion of each municipality's total eligible voters, rather than of valid ballots cast. If every voter had cast ballots within their home municipality, you could think of it as showing the minimum actual support for independence in each area, as if non-participants in the referendum had all voted NO. Of course, we shouldn't assume that all non-voters are against independence - even determined pro-independence voters were sometimes prevented by police from casting ballots - but it's likely that quite a lot of opponents sat this out, and we certainly can't assume the opposite. Yet as we've seen above, the movement of voters to other municipalities makes the situation more complicated: We can't really determine how many people supported independence in a municipality that was flooded with 400% voter turnout from other regions, to say the least. Still, major differences from the results map at the beginning of the article reveal some interesting patterns. 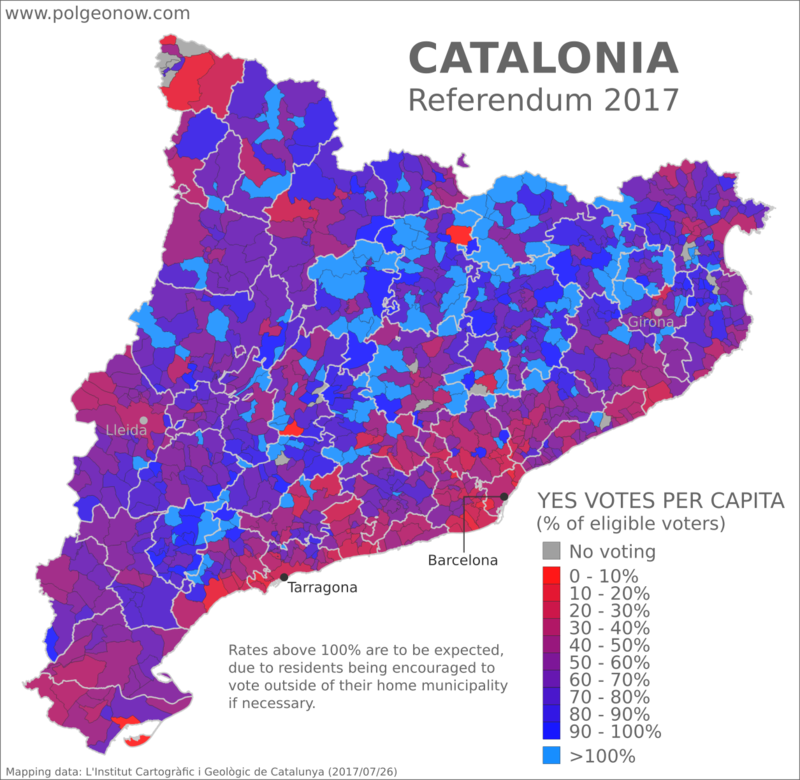 For one thing, it's clear from this map that we can't assume a majority of Catalans actually support independence: In the highly-populated areas along the coast and around major cities, the total number of YES votes for independence was often much less than half the total number of eligible voters. Even many of the rural central municipalities show proportions not much over half, if that. In fact, many geographical areas lost in the dark blue YES votes of the first map come out looking decidedly lukewarm about independence here, including the the area near Catalonia's northeastern border with coastal France, as well as clumps along the boundaries of the Spanish regions of Aragon to the west and Valencia to the south. And that's not to mention a smattering of new red spots peppered across Catalonia's rural interior. Where in Catalonia did people cast blank ballots? During the lead-up to Catalonia's attempted referendum, it was well-documented that many Catalans - including the mayor of Barcelona - strongly supported having a vote even though they opposed independence. Polls earlier this year put support for independence at just under 50%, while support for holding a referendum was over 70%. So it stands to reason that many anti-independence residents still made an effort to get out and vote NO. But what about undecided voters, who neither supported nor opposed independence but felt strongly about their right to vote on it? These people may have been largely responsible for the referendum's many reported blank votes - ballots cast without marking either the YES or the NO option on independence. And rates of blank voting varied significantly between municipalities. In our earlier article on larger-scale referendum results, we reported that the greater Barcelona region had a much higher rate of blank votes than other regions, averaging 2.6% compared to between 1.2% and 1.6% for other regions. 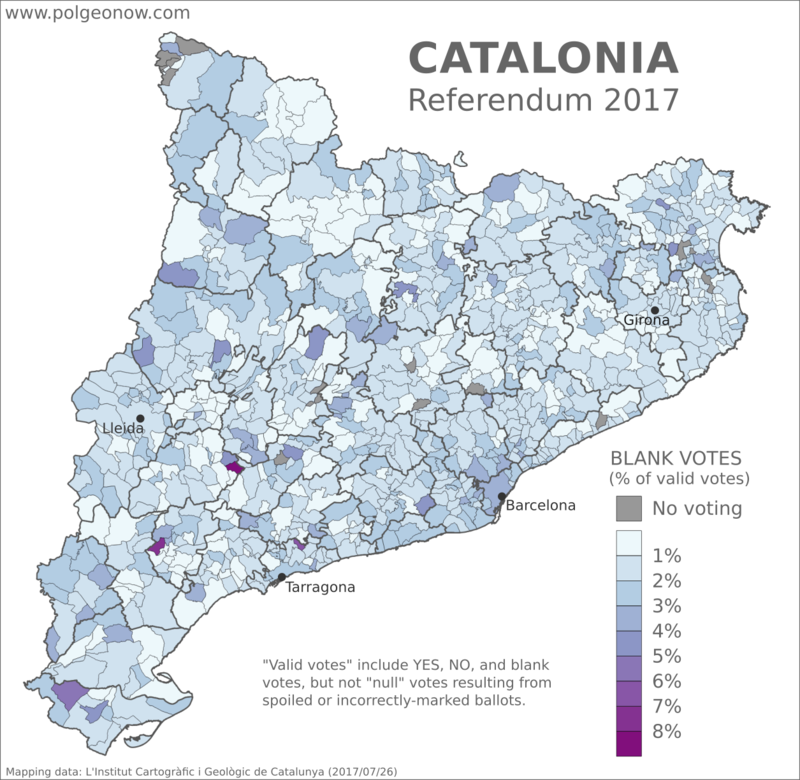 That's hard to see on the municipalities map, probably because high rates of blank votes in the Barcelona region were concentrated in just a few very high-population areas (recall that the city of Barcelona, which registered just over 3% blank votes, has a population of over one million). Variation in blank voting rates across central Catalonia don't seem to match up with any patterns from the other maps, and may be just statistical noise related to the very small populations of many rural municipalities. Tellingly, the three municipalities colored in darkest purple, for very high rates of blank votes, all have eligible voter populations of less than 150 people, with just three to six total blank ballots cast in each one. If just one person chose not to vote blank in these municipalities, the rate would see a major drop. It seems the main takeaway is that blank voting was a phenomenon mainly in Barcelona, more than in any other part of Catalonia. Perhaps this was a reaction to violent police crackdowns that took place in the city, or just part of the capital's specific political culture. Interestingly, Barcelona proper also had a relatively high rate of support for independence among participating voters compared to neighboring suburbs. Meanwhile, the cities of Lleida and Girona had rates of blank votes similar to the neighboring countryside, despite registering less overall support for independence. Stay tuned to PolGeoNow and the PolGeoNow Twitter feed for more updates on Catalonia's push for independence, plus new developments around the Kurdistan referendum in Iraq. Click here to view all Referendum 2017 articles.